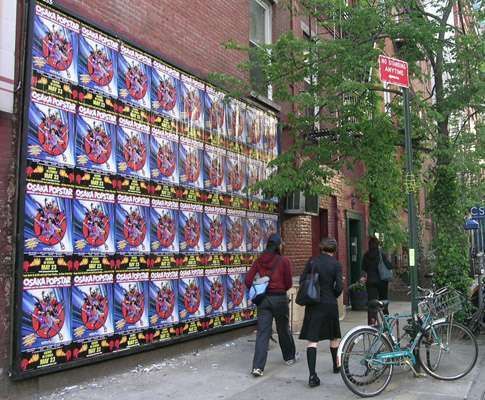 PUNK ROCK IS ALIVE AND WELL, FROM OSAKA TO NEW YORK CITY! INTRODUCING OSAKA POPSTAR AND THE AMERICAN LEGENDS OF PUNK! A World-Wide Smash in the making! An All-Star line up whose Power and Punch cannot be denied! 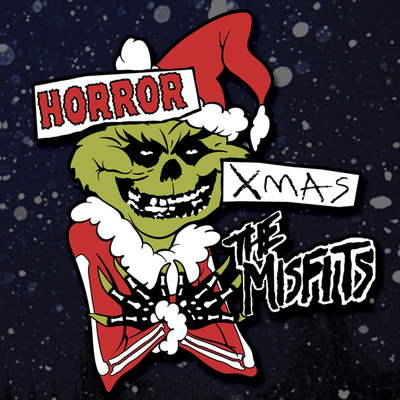 Fronted by long-time Misfits collaborator JOHN CAFIERO, OSAKA POPSTAR AND THE AMERICAN LEGENDS OF PUNK are a kick in the teeth to anyone who dared to think that punk rock’n’roll was dead! 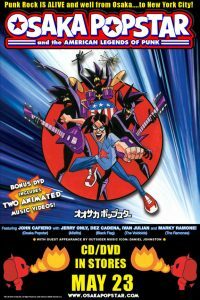 Cafiero has put together a band of SUPER LUMINARY ORIGINAL PUNK ROCK SUPER HEROES, featuring MARKY RAMONE (THE RAMONES), JERRY ONLY (THE MISFITS), DEZ CADENA (BLACK FLAG), and IVAN JULIAN (RICHARD HELL & THE VOIDOIDS). On their first CD they rip through a roller coaster of high-speed hooks and catchy choruses, recalling the very best of New York City Punk Rock! Noted for his spectacularly good taste and artistic vision (he is the producer and director of the gone-gold Ramones DVD RAW), Cafiero has picked a winner’s circle of cover songs to complement his originals. At the top of the list is WICKED WORLD written by renowned outsider music icon Daniel Johnston, who also contributes vocals on a terrific, revved-up cow-punk version of the traditional bluegrass lament “Man of Constant Sorrow.” A video of “Wicked World,” animated by Japanese designer Mari-Chan, is included on a bonus DVD with the OSAKA POPSTAR CD. OSAKA POPSTAR AND THE AMERICAN LEGENDS OF PUNK is a knock-out combination of heart-thumping thrills and indelible hooks…if it is subversive, it is only because it is too much fun. Can you handle this much excitement? OSAKA POPSTAR AND THE AMERICAN LEGENDS OF PUNK. WOW!!! 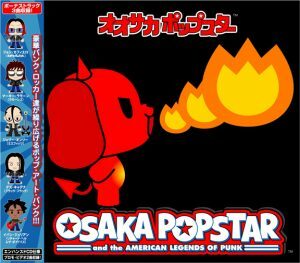 In its initial release in May of 2006 Osaka Popstar And The American Legends Of Punk reached #10 in the top 25 Albums, and #6 in the Top 25 Singles on the alternative specialty radio charts. By June, the album had reached #3 on Tower Records top selling rock/pop new releases, and Osaka Popstar’s animated music video for “Wicked World” was voted #1 by viewers on Fuse TV’s Oven Fresh. 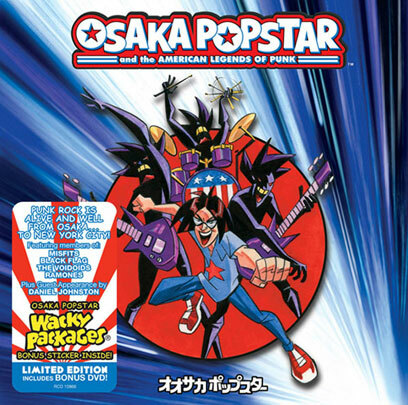 The North American Pressing of Osaka Popstar and the American Legends of Punk released in 2006 was a 2-Disc CD/DVD packaged in a dual jewel case. 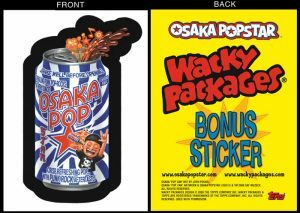 A free Ltd Ed Osaka Popstar Topps “Wacky Packages” bonus sticker was also included featuring Art by John Pound (Wacky Packages/Garbage Pail Kids), based on a concept by John Cafiero. 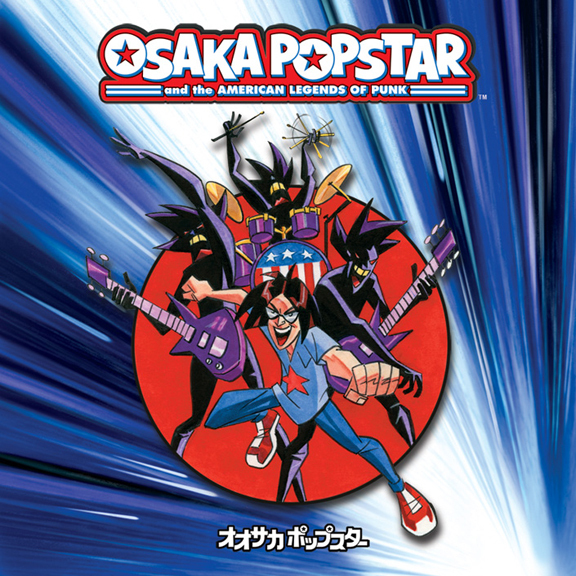 Osaka Popstar and the Amercian Legends of Punk was released domestically in Japan on one of Japan’s leading punk labels (Imperial Records) on June 27, 2007. 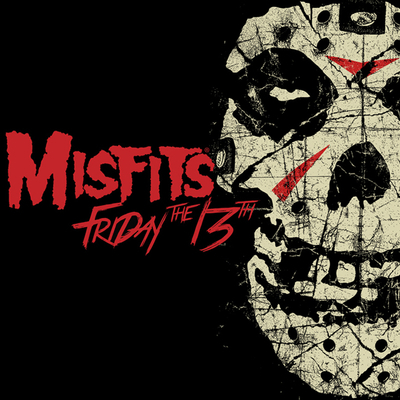 The Japanese release featured alternate cover art, an Obi and 3 live bonus tracks (“Wicked World”, “Sailor Moon” and “Beat on the Brat”). 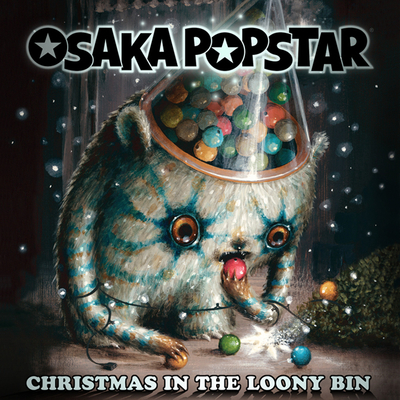 The 3 live tracks would later appear on Osaka Popstar’s “Rock ‘Em O-Sock ‘Em Live” CD released in 2008 on Misfits Records.